Animating your character with iClone allows you to bring life to your custom iClone character by easily assigning one of the many included motion capture files to instantly see your character move inside the scene. 1.Open either a project you have created yourself, or one of the existing template projects. Do this by clicking the Project button and double clicking one of the projects in the file manager pane. If you saved a project after reading the previous tutorial, use that project. Remember, your custom projects are in the Custom tab, and the predefined template projects are in the Template tab. 2. Click the Animation button and then the Motion button, or click the Motion option in the drop down menu. 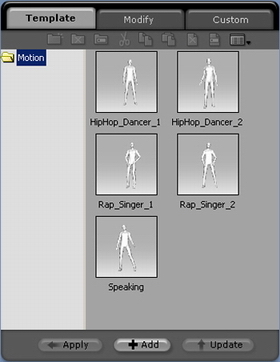 3.From the Template tab in the file manager pane, double-click a motion to use for your character. When you click the Play button you see your character move. You can alter the motion of your character by using the Modify tab. If you want to edit the current motion, or create a new motion based on blending custom poses and motions together click Motion Editor Launch button, refer to Motion Editor Help for details about editing character motions. iClone provides compatibility with the BVH motion format allowing you to import many existing motion files from third-party software or motion libraries. 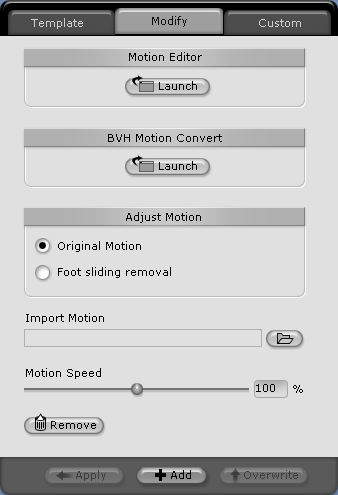 If you want to convert BVH files into the iClone motion format, click BVH Motion Converter Launch button, see BVH Motion Converter for details. Note: BVH conversion requires that the appropriate BVH motion profile exists to translate the BVH file into iClone format. You can adjust the speed of the selected motion using the Motion Speed slider. You can also import a new motion from a file. If you like the result, you may want to add your new motion to the list of custom motions.